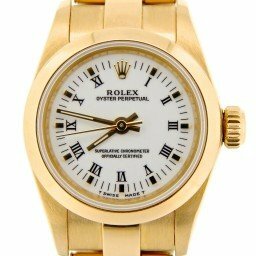 BeckerTime inventories a fine selection of Rolex Oyster Perpetual ladies yellow gold used watches sized 24mm, and are offered in a variety of dials, bezels and bands with yellow gold. As an additional benefit, BeckerTime offers personalized customer service to assist you with this process.  We offer a 30-day money-back guarantee with each purchase and a one year warranty on most watches. In addition, we offer after-sales support and a Lifetime TradeUp Guarantee on qualified items. This means you can come back to us when you want to upgrade to another model. So, please don’t hesitate to contact us. For better or for worse, the history of wrist watches is generally the history of men’s watches. But no Rolex history series would be complete without looking at those watches produced for the ladies. And not just because Rolex produced ladies watches. 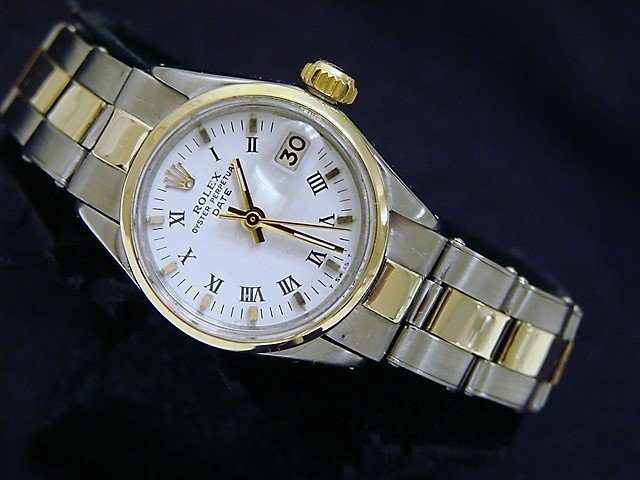 Indeed, ladies watches were the first watches Rolex produced, starting in 1905. And the ladies dominated the Rolex catalog until the 1930s. Now it’s undeniable, ladies dress watches are gorgeous as jewelry. But sadly, are rarely worth more than the weight of the precious metal they contain. 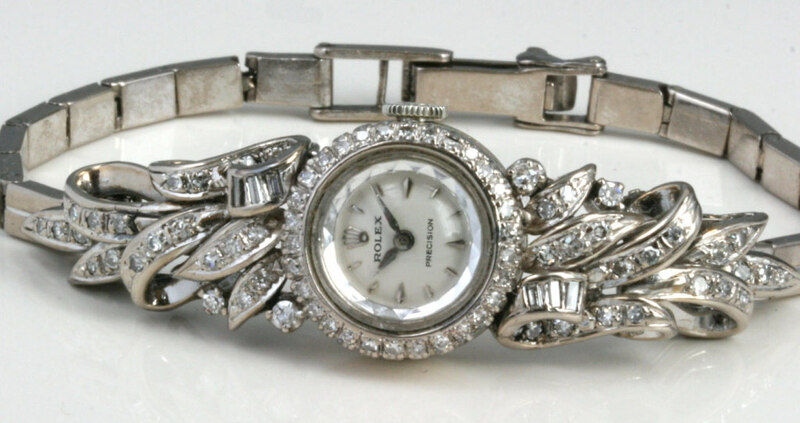 Vintage mid-century examples of Rolex Ladies dress watches are no different. Early pieces may be the exception, given their rarity. While most early ladies models were as much jewelry as timepiece, Rolex introduced the Oyster in 1926 (for both men’s and ladies watches). Starting then, Rolex Ladies watches gradually evolved into Oyster models that echoed their manly brethren – the Date, the Datejust, the Oyster Perpetual, the President, and the Yacht-Master (which we’ll cover later when we look at the men’s Yacht-Master series). The Corona, the first styled ladies Rolex Oyster was introduced in the early 1930s. By 1936, Rolex had introduced six more Oysters based on that design. Popularity remained low, however, and all were withdrawn by 1940. Men’s watches were beginning to dominate the catalog. 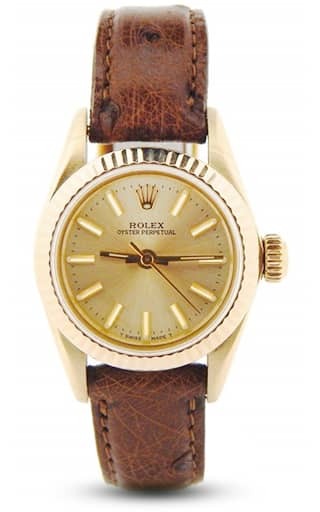 The Men’s Datejust was introduced in 1945, for Rolex’s 40th Jubilee. A Ladies watch, the 4487, was introduced at the same time but it was not an Oyster. That would not come for another nine years. Rolex introduced the Lady Oyster Perpetual Chronometer at the Basel Watch Fair in 1954. This felt like the true beginning of the modern era of Ladies Rolex Oysters. The Lady Oyster Perpetual was a downsized, feminized version of the men’s Oyster Perpetual, with all the attendant features – screw-down crown, fluted bezel, and bracelet. Chronometer certification did not begin to appear for the ladies line until around 1960. The Oyster Perpetual eventually spawned the Lady Date, the Lady Datejust, and the Lady President. These four models represented four trim levels and associated price points for four different customers. The Oyster Perpetual (no date function) and the Lady Date were non-chronometer watches. The Lady Datejust and Lady President were certified as chronometers. The Lady President was the Datejust with a ladies version of the President bracelet replacing the Jubilee bracelet. Variations on these three or four themes remained through the late twentieth century and up to today. Currently, the Ladies line consists of 26mm, 31mm, and 34mm watches, all in the Oyster Perpetual line, all certified chronometers, and all signed Datejust. It seems Rolex has done quite well in remembering the ladies. Ever wonder about the backstory of your favorite Rolex? Well, stick with us. 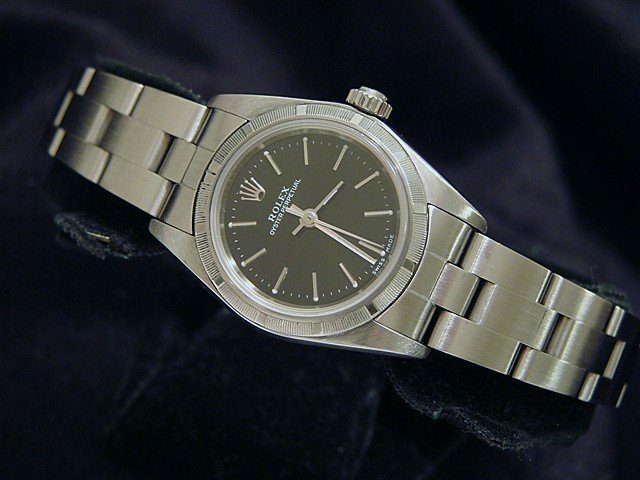 This is the ninth in a series of posts featuring histories of significant Rolex models. 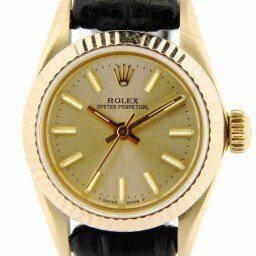 In all, Rolex has introduced nearly three dozen models since 1950. Over the next several weeks, we’ll touch on each. You’ll find all the reference numbers connected with each model here. In my opinion, a ladies gold Oyster Perpetual watch is the equivalent of that little black dress every fashionable lady has in her wardrobe. Ever faithful and dependable, it can be worn almost anywhere at anytime and never be inappropriate. 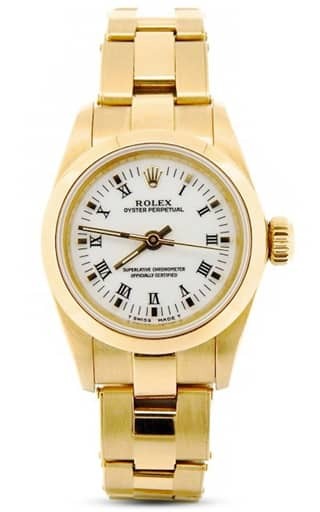 In addition, the watch’s signature “Rolex” look, precious gold, and prestigious name make it stand out. Yet, its classic design, minimalistic dial, and smaller size keep the timepiece understated and chic. Perhaps the best part, however, is its price. The ladies gold Oyster Perpetual is significantly less expensive than its more famous sister, the gold Datejust. Besides, what stylish lady doesn’t enjoy a good deal? Read on to find out more about the ladies gold Oyster Perpetual Rolex watch. 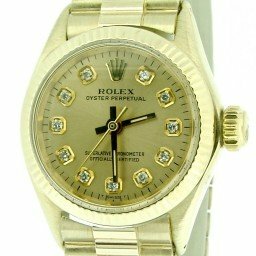 The ladies gold Oyster Perpetual watch was part of Rolex’s catalog for a long time. This means that there are several models to choose from. While there are older models, we’ll pick up from the seventies and take a look at the collection’s evolution from there. 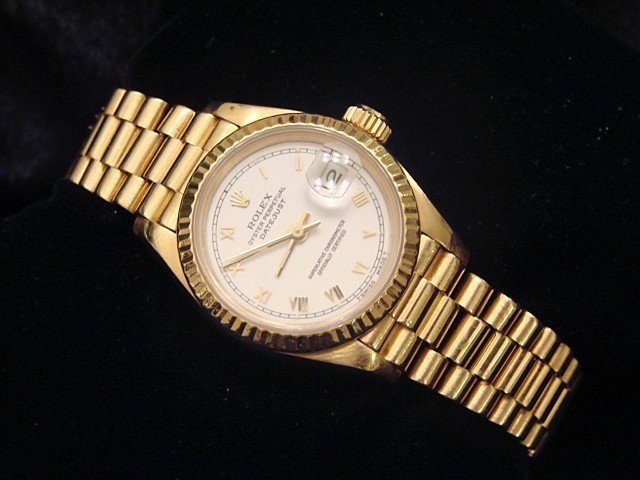 Rolex produced the ladies’ gold Oyster Perpetual ref. 6718 with the smooth bezel and the ref. 6719 with the fluted bezel from the mid-1970s to the mid-1980s. Also, these particular models sport cases that measure about 24mm and the dials are protected by a plastic crystal. In the mid-1980s, the scratch-resistant sapphire crystal was introduced to better protect the dials. From this era, there’s the choice of the ladies’ 14k gold Oyster Perpetual ref. 67197 with a fluted bezel, the 18k gold ref. 67198 with a fluted bezel, the 14k gold ref. 67187 with a smooth bezel, and the 18k gold ref. ref. 67188 with a smooth bezel. 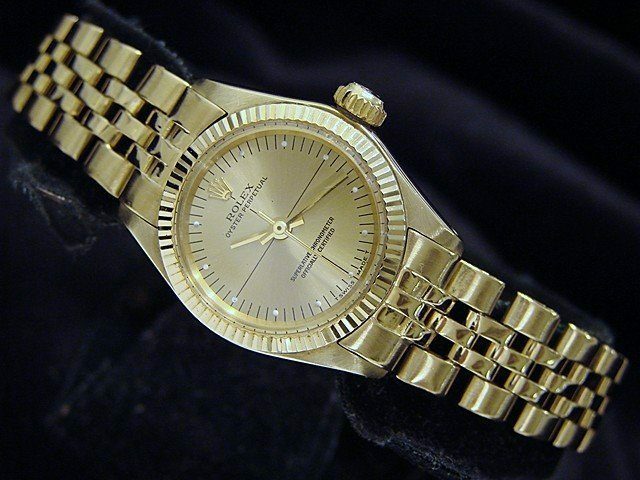 Then, in the late 1990s, Rolex crafted all versions in 18k solid yellow gold. Choices include the Oyster Perpetual ref. 76198 with the fluted bezel and the Oyster Perpetual ref. 76188 with the smooth bezel. 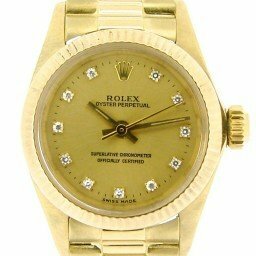 Unfortunately, Rolex no longer manufactures a gold version of the ladies’ Oyster Perpetual. But, lucky for us, there are plenty to choose from in the secondary market. There is a variety of dial colors across all versions of the ladies gold Oyster Perpetual. Shades range from matching champagne to rich black to fresh white and some others in between. There’s also a choice between stick indexes and Roman numerals. However, it’s worth noting that a popular move is to customize ladies’ gold Oyster Perpetual watches with diamond hour markers. A dash of diamonds certainly never hurt anyone! Bracelet varieties include gold three-link Oyster bracelets for a sporty touch or the gold five-link Jubilee bracelet for a dressier look. I’ve even seen some ladies’ gold Oyster Perpetual outfitted with the coveted President style bracelet with the semi-circular links. 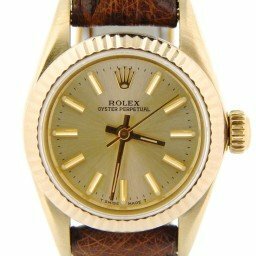 While I appreciate a solid gold bracelet, one of my favorite things to do with a yellow gold Rolex watch is to wear it on a leather strap. Not only is it much lighter to wear, but I love the sophistication and elegance of a classic leather strap—neutral or bright colors, it all works. It’s a simple and economical way to completely change the look of your Rolex! So if you’re searching for a yellow gold woman’s Rolex to add to your watch wardrobe, then explore the ladies’ Oyster Perpetual collection. You may just find a watch that’s as perfect as your faithful little black dress.